In close collaboration with international scholars and archives, CineGraph and Bundesarchiv-Filmarchiv have developed a new concept for their traditional conference, expanding it into a Festival of German Film Heritage. Apart from exploring new and forgotten areas of film history, the festival will provide a prominent showcase for archives which preserve and restore the treasures of German Cinema. The aim is also to create a forum for academics, students, archivists, technicians and film buffs to exchange information and discuss new developments. This will be the first festival to focus on German film heritage, thus filling an important gap on the international circuit of specialist film events. An extensive retrospective looking at a key aspect of the history of film in Germany will be combined with workshops and conference sessions, allowing guests to see rare films from German and international archives while exchanging information and ideas with a range of professional colleagues. The film programme will subsequently tour to Berlin (Zeughauskino  Deutsches Historisches Museum), Vienna (Metro Kino / Filmarchiv Austria), and Zurich (Filmpodium / Cinemathèque Suisse). Comedy in Germany in Wihelminian, Weimar and Nazi Cinema. The special focus  and theme of the 17th congress  will be the contribution of Jewish comedians and filmmakers to the genre as well as the attempts of the Nazi film industry to fill the gap it created by expelling most of the best talent from Germany. 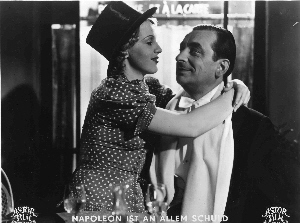  Entertainment films with which the Nazis tried to cheer up the German people, including films with Heinz Rühmann, Rudi Godden, PARADIES DER JUNGGESELLEN (1939) or ROBERT UND BERTRAM (1939), Hans H. Zerlett's anti-semitic musical, based on a 19th century farce. Also songs by composers Werner Richard Heymann, Friedrich Hollaender, Franz Wachsmann, performed by The Comedian Harmonists or Weintraub's Syncopators.